IBM unveiled a raft of changes to its partner engagement models during its Think 2018 event last week, but it was partners’ pace of transformation that was on the mind of Big Blue’s channel execs, according to Forrester global channels principal analyst, Jay McBain. During the IBM PartnerWorld program, held in conjunction with its Think 2018 conference in Las Vegas last week, the company revealed new partner engagement initiatives as part of its efforts to focus on ‘higher-value’ solutions such as artificial intelligence, cloud, blockchain, security and as-a-service offerings. As reported by ARN on 22 March, the changes are aligned to the vendor's new partner ecosystem, which will come into effect in April. IBM general manager of global business partners, John Teltsch, revealed that the company would offer partners flexible benefits and support by enhancing its newly-expanded software-as-a-service (SaaS) trials, sandboxes, IBM Cloud credits and development assistance for partners. Teltsch said the vendor will also expand marketing development funds in order to align with partners building new skills in areas such as digital marketing. Additionally, IBM said it would launch a new digital self-service platform aimed at partners building and selling solutions integrated with the vendor's technology. In earnestly transforming its partner program and incentives, IBM is making it clear it wants partners to have a larger handle on 'commercial' business opportunities. It remains to be seen, however, whether partners in the company’s channel ecosystem are poised and ready to take on the changes. 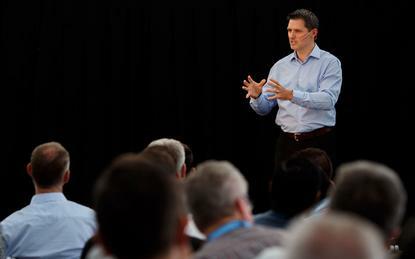 “It was a tale of two events,” McBain said in a blog post reflecting on the recent IBM event. “In the hallways and closed sessions afterwards, IBM channel executives expressed frustration that partners’ transformation is not keeping pace with their organisation’s business transformation. “IBM has stacked its channel team with great talent, from both internal and external hires, to build the partner program of the future. But execution is lacking, even though the strategy seems buttoned-up,” he said. The forces behind the potential disconnect between what IBM is attempting to do with its partner engagement overhaul and what partners are willing to take on, come down to a number of potential factors, according to McBain. These include an over-representation of large, long-term loyal partners in the channel engagement process that may be in the habit of lobbying for self-serving tweaks to the traditional partner program. Another contributing factor, according to McBain, could be that, although Big Blue is now working to boost its partner engagement by doing things like opening up sandboxes and offering open APIs, many other vendors have been doing so for years. McBain also points out that success in the small and medium-sized business sector and shadow channel recruitment lies in pursuing partners in their own communities, an area where IBM may be falling short, according to the analyst. “I spoke with several IBM execs who still think they are one program, product, price, packaging, or promo away from success. Until this law of attraction changes, IBM will never meet its ideal partners of the future,” McBain said. “Shadow channels such as XaaS [anything-as-a-service] ecosystem partners, industry-based service companies (accountants, digital agencies, etc. ), ISVs, born-in-the-cloud, and even startups don’t participate in programs in the same way. “They won’t take the time to sign on to a bronze level, negotiate a contract, get onboarded, and certified over six months. They definitely won’t have patience for traditional incentives and co-selling or co-marketing motions,” he said. McBain conceded that he empathises with the challenges faced by IBM, but stressed that breaking into new communities and understanding the shadow channel and its motivations is critical to building "a channel of the future". “The strategy is simple — the execution is painfully hard,” McBain said. “IBM will need to realign its talented partner and alliances team to build a parallel channel. “The traditional channel will need continual nurturing, but the focus needs to be on those that will drive the IBM emerging technologies portfolio into millions of new customer discussions,” he said.